A new kind of drivetrain system debuts at Eurobike, and it’s shaking people’s belief systems. “No chains. No derailleurs.” The future of the bike looks kind of weird, to be honest. But the new derailleur-free drivetrain showcased by CeramicSpeed at Eurobike this week has been one of the show’s highlights. And the industry is buzzing, disposing of old ideas about what a bike should look like. Electronic, wireless shifting seems almost old-school in the wake of this odd-looking, toothy system that promises ultimate efficiency. The Driven system is still only a prototype and isn’t ready for any bike right now. Currently, the driveshaft system requires a special frame. But it offers a wicked-cool concept that could certainly make its way to production bicycles in the future. 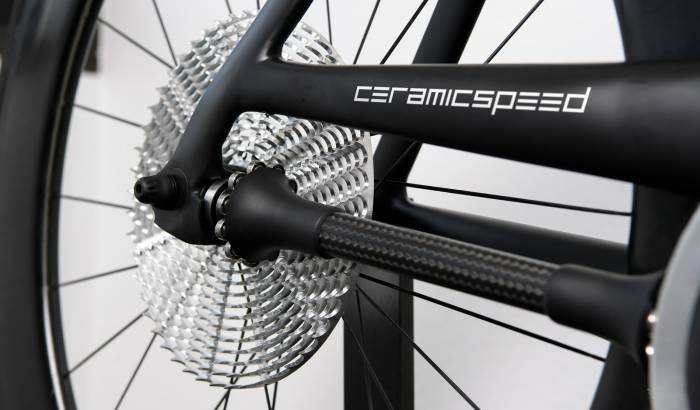 This method for shifting might look strange, but CeramicSpeed claims it creates 49 percent less friction compared to the market-leading chain and derailleur drivetrain. Additionally, its nearly two-dimensional profile could significantly reduce drag, making it a more aerodynamic system while also dropping it to a lower weight — all thanks to a carbon driveshaft instead of a metal chain. To be sure, companies have dabbled with driveshaft bicycles. But these setups often offer less power efficiency than do chain-driven bicycles. Plus, early designs hampered changing out flat rear tires. It’s unclear how a production model Driven would address the latter, but the brand and some testers claim the system’s efficiency is not an issue. For those already looking to preorder the crazy new Driven system, you’re out of luck. It’s far from production ready. In conjunction with the Mechanical Engineering Department at the University of Colorado, CeramicSpeed has been developing the derailleur-free drivetrain for only nine months now. Obvious challenges include the need for an entirely different frame with a higher chainstay, plus specific wheels for the rear cassette. It could also get even cooler. To reduce wear and tear, future versions will potentially involve integrating the driveshaft into the frame. We’ll certainly be keeping an eye on the Driven concept as it develops. And we’ll watch to see if any industry leaders start experimenting with other new ways to look at the traditional drivetrain model.